[map] [street view] Near where Milk Springs Road and New Cut Road meet, just west of Old US Highway 43. Co-located with WFIX on the tallest of the three visible towers in the street view. The shorter tower houses WLAY-FM and WVNA-FM. 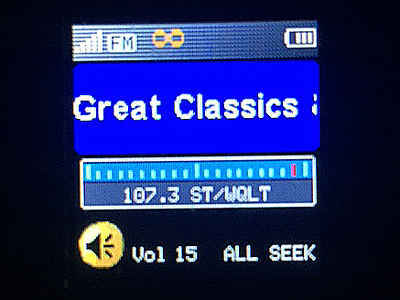 [RDS] Radio's text display as seen on an Insignia HD portable. This station was first put on the air in August of 1962 by Radio Muscle Shoals, owners of AM 1240 WOWL and TV channel 15 WOWL-TV. As WOWL-FM, it originally ran 4.6 kW of power and was likely a simulcast of the AM station's format. They appeared to be unable to make a success out of it, and it went dark and the license was deleted. This frequency came alive again in the summer of 1967, when WJOI, Inc. (formerly Florence Broadcasting Company, Inc.) put a station on the air at this frequency with 25,000 watts of power. As WQLT (QuaLiTy Radio? ), it was programmed separately from the AM, although it's unclear what the format was in the early days. During this time, it transmitted from the AM's tower and studios, located at 624 South Chestnut Street in Florence. The transmitter was a Gates FM-5B and the antenna was also a Gates, model FMA-6A Cycloid (PDF, from the American Radio History website) with 6 bays. By the mid-70's, the company that owned the station was being run by the legendary Sam Phillips, of Sun Records fame. Under him, the station boosted power to 100,000 watts in 1977 and launched a Top 40 music format. At this time, the transmitter site moved to its current location just off Milk Springs Road. The station dropped Top 40 for Adult Contemporary in the mid-80's and has that format ever since, marketing itself as "Q 107".